Study for COBIT 5 certification at foundation level with our online training course! This course has been accredited by APMG and created by leading experts to provide you with everything you need to pass the COBIT 5 Foundation Level exam. Our COBIT 5 foundation qualification is a pre-requisite for advancement to higher levels of COBIT 5 accreditation, such as COBIT 5 Implementation and subsequently COBIT 5 Assessor. Become a certified COBIT professional, and join the elite group of qualified COBIT5 professionals worldwide! COBIT aims “to research, develop, publish and promote an authoritative, up-to-date, international set of generally accepted information technology control objectives for day-to-day use by business managers, IT professionals and assurance professionals”. With this course, you’ll receive 6 months access from the date of purchase as well as a FREE exam voucher to use whenever you are ready to sit the COBIT 5 Level 1 exam! COBIT 5 is the only recognized business framework for the Governance and Management of Enterprise IT. Since the launch of COBIT 5, tens of thousands of professionals are seeking to become certified worldwide each year! This qualification is a pre-requisite for advancement to higher levels of COBIT 5 accreditation, such as COBIT 5 Implementation and subsequently COBIT 5 Assessor. Why Study COBIT 5 Foundation with 4PA? COBIT 5 can benefit and support organizations of all sizes and type get the most of out of their IT by balancing the need to create value with the requirement for managing levels of risk and usage of resource. Why Adopt COBIT 5 for Your Organization? COBIT 5 is the globally accepted framework for managing and governing an organization’s IT. COBIT supports the concerns of both the business and IT function, and addresses the interests and needs of an organization’s internal and external stakeholders. COBIT 5 is an evolutionary jump from COBIT 4.1 and takes into account leading-edge practices and approaches from governance and management. Version 5 also provides compatibility and integration with external frameworks and standards, such as ITIL® and ISO, and ISACA’s Val IT and Risk IT standards. This eLearning course provides you with all the training and materials that you will need to prepare for the COBIT 5 Foundation exam. In the course, you will learn about Technology Governance and Control Frameworks, applying a Single Integrated Framework, Separating Governance from Management, evidence-based assessment, and much more. Thinking of sitting the COBIT 5 Exam? Here you’ll find everything you need to know! Upon completion of the COBIT Foundation eLearning course, you will have learnt everything you need to know in order to prepare, sit, and pass the COBIT Foundation Level exam. Remote Proctor Now are the authorized providers of exams for COBIT 5. When you feel ready to sit the exam, just contact support or give us a call. Your free exam voucher is valid for 12 months from the date of issue and must be claimed within 6 months of first course access. 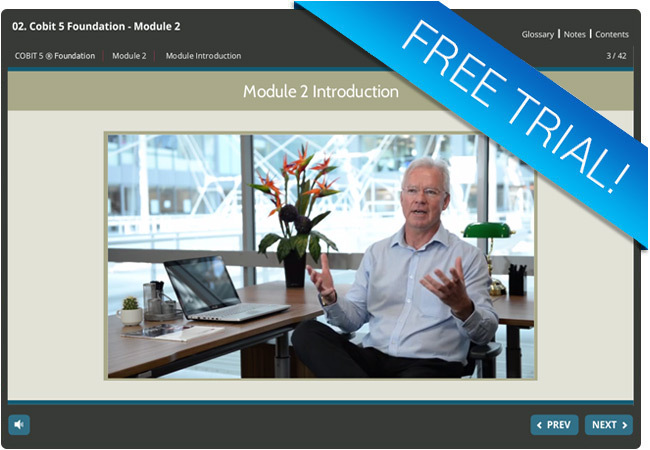 Why not try out a free trial module from our COBIT 5 Foundation eLearning course! In this COBIT 5 Foundation trial module, you will learn about Governance, Enterprise Governance, and IT Governance via a mixture of interactive and audio techniques to enhance the learning experience. Like the full COBIT 5 foundation eLearning course, you can access this free trial module from any device whether you are at home, at work, or on the move!